In this episode of the TiLT Parenting Podcast, I’m talking with a dear friend and mentor of mine, Jess Weiner. Jess is a CEO, author, podcaster, and cultural changemaker who’s been working in the business of empowerment for more than twenty years. Jess actually helped guide Mattel in the big change in the iconic Barbie doll last year, introducing more realistic body types, new skin tones, eye color, and hairstyles, to the doll. Though she’s not a typical parenting expert, Jess is all about shifting cultures, and that’s why she is the perfect person to talk with us. More than anyone I know, Jess knows how to use her voice and advocate, even when she’s up against long-standing, seemingly immovable paradigms. 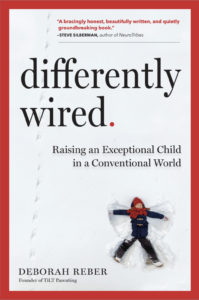 Sound like something we parents of differently-wired kids could use some help with? (Um, YES!) This episode is a powerful conversation about what it takes to speak up and make a ruckus, even if that’s a role we may not be comfortable playing. I hope it gets you fired up! About Jess: Jess Weiner is a CEO and cultural changemaker with over 2 decades of experience in the business of empowerment. During this time she has been responsible for two enormous culture shifting moments with Barbie’s latest body evolution and Dove’s memorable Real Beauty campaign. As the CEO of TTJ, a consulting firm that advises Fortune 100 and 500 companies on the best practices for creating a message of empowerment, Jess is called a “sought-after secret weapon” by her clients. All of her work is rooted at the intersection of social change and marketing. She hosts a podcast called “Talk To Jess” interviewing today’s movers and shapers of culture. Find out more at JessWeiner.com.